Bringing you news and insights about Tribal Art, its creators and its collectors. Didn't get exactly what you want at Christmas? Haven't figured out how to use your tax bonus? have money-saving opportunities for you. For the first 10 days of 2018, we are reducing by 25% every item in our Zuni fetish, Indian jewelry, Native American pottery and miscellaneous tribal art collection. Because so many items are involved, and the prices will return to what the are before the sale, changing every price on the web sites is a ton of work. So to take advantage of this 25% saving you are asked to call us toll-free at 1-800-305-0185 and let us know what you want to order. We will adjust the price on those items for you alone. and arrange for you to pay using Paypal. It's really simple, and much more personal than using a shopping cart. Visit http://www.ZuniLink.com if you are interested in fetish carvings or Native American Indian jewelry. Find the item(s) that turn you on, and call us at 1-800-305-0185 with the inventory number. If those items are still available, we will knock 25% off the listed price, accept your credit card information or and send you a Paypal invoice for the reduced price. When your payment is confirmed, your order will be shipped to you by the next business day. Or, if Native American Indian and Pueblo pottery are your interest, visit us at http://www.Native-PotteryLink.com and call us at the toll-free number. We will talk you through the same process. Finally, if you are interested in Native American folk art, You will find those items at http://www.TribalWorks.com. Again, when you find something that interests you, call us. We will take it from there. Suddenly, "fake news" is a hot topic. But this news is real and good news. 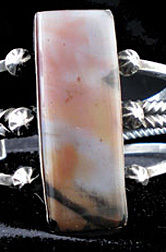 Aboriginals Gallery and its online subsidiaries at https://www.ZuniLink.com, https://www.Native-American-jewelry.org and https://www.Native-Potterylink.com. Are pleased to share this news with you. Every time someone purchases a fake Native Fetish Carving, fake item of Native American jewelry or a fake Pueblo pot, they take income and grocery money out of the pocket of a bona fide Native Artist. Five individuals are being charged with violating the Indian Arts and Crafts Act after they allegedly imported and fraudulently marketed fake Native American jewelry. A federal grand jury in Albuquerque returned an indictment February 9 charging five people of marketing or distributing fake Native American jewelry that was manufactured or imported jewelry from the Philippines. The indictment identifies 40 specifics fraudulent acts, including sales of the jewelry in stores in Albuquerque and Santa Fe, New Mexico, to individuals who were unaware they were purchasing fake Native American jewelry. Additionally, more than 50 financial transactions took place between April 2014 and October 2015, the indictment states. Sales involved more than $300,000 total, in amounts ranging from $1,100 to $60,000. The recent indictment is the second to come as a result of a continuing federal investigation that began in January 2015 and led by the U.S. Fish and Wildlife Service, Homeland Security and the Federal Bureau of Investigation. The investigation targeted an international scheme to violate the Indian Arts and Crafts Act, which prohibits the marketing or sale of any good in a manner that falsely suggests that it is Indian produced, an Indian product or the product of a particular Indian tribe. Law enforcement agents executed eight search and seizure warrants in New Mexico, California, Alaska, Kentucky, Nevada and the Philippines. According to the indictment, the following four individuals are being charged with conspiring to violate the Indian Arts and Crafts Act, fraudulent importation, money laundering, wire fraud and mail fraud: Imad Aysheh, 41, formerly of Gallup, New Mexico, identified as owner and operator of a jewelry manufacturing business in the Philippines; Iyad Aysheh, 45, of Lodi, California, identified as CEO and agent for a California operation that imports jewelry into the United States; Raed Aysheh, 39, of American Canyon, California, identified as the owner and operator of a retail store that specializes in Native American-style jewelry; and Nedal Aysheh, 37, formerly of Gallup, New Mexico. The indictment alleges that, between March 2014 and October 2015, Imad Aysheh manufactured Indian-style jewelry using Filipino labor for import into the United States while Nedal Aysheh provided source material and trained Filipino laborers. It also alleges that Iyad Aysheh imported jewelry, Iyad Aysheh and Raed Aysheh accepted shipments and Iyad Aysheh, Nedal Aysheh and Raed Aysheh distributed the fake Native American jewelry in stores specializing in the sale of Native jewelry. The indictment further alleges that the four defendants conspired to defraud the United States of money by using the U.S. mail and wire communications to promote the importation and sale of the Filipino jewelry as Indian-made, and to launder the proceeds of these sales. A fifth defendant, Nael Ali, 53, of Albuquerque, also is charged with violating the Indian Arts and Crafts Act in October 2015. Ali is owner and operator of two arts and crafts retail stores in the Old Town section of Albuquerque. The indictment seeks forfeiture of more than $20,000 in cash, $6,723 in a bank account and more than 1,000 pieces of Indian-style jewelry. The five defendants are ordered to appear in federal court for arraignment. If convicted, they each face a maximum penalty of five years in prison and a $250,000 fine." Do not allow yourself to be conned out of your hard-earned cash. Always insist on a signed Certificate of Authenticity when you buy a Zuni fetish, a Navajo bracelet or Pueblo pottery. One of our favorite Zuni artists is retiring. Lena Boone's Zuni carving heritage goes back to the legendary Teddy Weahkee (d.), one of the first Zuni artists to carve fetish creatures, arguably the very first carve them as an art form. Born in 1946, Lena has worked enough years to decide to stop carving. This is a considerable loss to collectors of Zuni fetish carvings. Lena and her sister, Dinah (Gasper), were daughters of the Teddy's daughter, Edna Leki (d.), who was also a highly collected carver. Dinah was married to Peter Gasper Sr. (d.). There offspring included carvers, Debra Gasper (Tsethlikai) and Peter Gasper, Jr. All of who carried on the carving tradition. Lena, who was married to Rignie Boone (d.), has two children, Evalena Boone and Leland Boone. Both continue to carve. It was the continuation of a beautiful friendship with the Weahkee family. We continue to visit with Lena, Evalena, Leland and Robert Michael at her Zuni home each year. ZuniLink.com encourages you to take advantage what is available. We also encourage you to consider the work of Lena's Weahkee family, all of which is outstanding. Elah kwa. Zuni is one of our favorite pueblos. The setting is serene and the people cheerfully share their culture with respectful visitors. In recent years, Zuni Pueblo has hosted an event called Zuni Main Street Fest. It is a splendid reason to visit the pueblo. While out-of-the-way, Zuni Pueblo is not hard to find and is easy to enter. In addition to attractions like the dances, a major attraction is the number of shops and stores that show and sell Zuni fetish carvings. There must be thousands of people collect these carvings that represent some of Zuni finest art. Of course, if you can't make the trip to Zuni for some reason, you can shop for authentic Zuni fetishes online. One of the most experienced and reliable dealers in Zuni fetishes is ZuniLink.com. The site has hundreds of Zuni fetish carvings and video interviews with the an assortment of carvers such as Brian Yatsattie, Dee Edaakie, Robert Michael Weahkie, Burt Awelagte and more. Visit ZuniLink to learn more about Zuni fetishes and their carvers. As they say in Zuni, "Elahkwa"
Zuni is one of our favorite Indian pueblos. The setting is serene and the people cheerfully share their culture with respectful visitors. A recently inaugurated event at Zuni has been the Main Street Festival. Here an example of the dancing that took place at the 2016 event. This is an excellent reason to visit the pueblo. Fortunately, while off the beaten path, it is not difficult to find and get to. Another reason is to acquire Zuni fetish carvings. There are a handful of commercial fetish dealers within in the fetish grounds. But, in the age of the internet you don't have to visit the pueblo, pleasant and enticing as it is, to start or add to your Zuni fetish collection. One of the most experienced and reliable dealers in Zuni fetishes is online at ZuniLink.com. 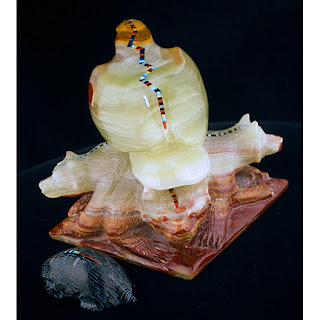 The site includes hundreds of Zuni and other Native fetishes, including bears, eagles, mountain lions, badgers and more, carved by the likes of Lena Boone, Dee Edaakie, the Quams, the Quandelacys, Bryan Yatsattie, Melvin Sandoval, Salvador Romero (Cochiti) and more. Recognizing that judging a fetish by a photograph alone can be problematic, ZuniLink provides a satisfaction guarantee so you can return any purchase you are unhappy with when you receive it and have your purchase price refunded. Plan to visit Zuni Pueblo and ZuniLink. As they say at Zuni, "Elahkwa". What is a Zuni Six Direction Set? Native American Fetish carving is a pains-taking, dirty, difficult and demanding activity, often taken for granted by the excellence of the outcome. From the detail of carvers such as Brian Yatsattie and Wilfred Cheama to the abstraction of Melvin Sandoval and Lynn Quam to the natural inspiration of Salvador Romero and Wilson Romero, there is much to love and be awed by. These Six Directions sets capture the spirit of ancient Zuni belief of six creatures that were charged by the Creator with protection of the Zuni people from threats from the North, West, East, South, above and below. The mountain lion in the North, the bear in the West, the badger in the south, the wolf in the East., the eagle above and the mole below. Each as selected for the innate power, strength and cunning as percieved by the Zuni people. They mayu be presented by a carver in several ways. Some carvers chooseto presnet all six in a single carving (with the mole occasionally included as a seperate carvind lodge in the underside to the stone specimen.). Another format uses a single large creature with five smaller creatures secured to the larger carving with sinew or wax string. A third approach is to carve each protective animal as a single creature and gather the six as a set. Each carver has a different artistic vision reflected in a different stylistic approach. Perhaps it is the seriousness of the subject matter but a six direction set seems never to be taken on as anything but the highest calling of the carver. Collectors of Six Direction sets like to build menageries that show a breadth of approachees. Examples of the best are available for previewing at https://www.zunilink.com/zuni-six-directions-at-zunilink. In the interest of broadening awareness and the appeal of Six Direction carvings, the website is offering a special sale price of 30% off the regular listed price through July, 2016,. World-renowned religious symbol takes on a stunning change of meaning. In Ancient Roman times, the “cross” was associated with shame and public ridicule. Common criminals were crucified as a form of punishment. But then, with the crucifixion of Jesus Christ and his resurrection, the effect on his millions of followers led to a dramatic reversal of the symbolism of the cross. The “cross” became a symbol of God's Love. Today, crosses are worn as a pendants by millions of men and women. Among the cross pendants that are so popular among believers are those created by talented Native American jewelry artist. Their works range from simple silver cruciforms to joyful products featuring semi-precious gemstones and intricate and colorful shell overlay. Native American cross pendants are widely available and very affordable. 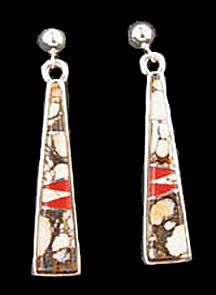 Many Native American art galleries offer them in outlets across the Southwestern United States, starting as low as $35.. As with almost everything else as well, Navajo, Zuni and Kewa Indian cross pendants are offered worldwide through online galleries, such as Native-American-jewelry.org, that work directly with the artists who create them. Women are no longer waiting for men to shower them with gems, according to a recent article in Newsweek magazine. Alice Hart-Davis writes that jewelry, long considered something men buy as gifts to win the favor of women, is showing up on women's own shopping lists. Giving up on waiting for a clueless man to buy a gift of fine jewelry, women are shelling out the cash to acquire beautiful gemstones and works of jewelry art for their wardrobes. And doing so with enthusiasm and joy. They are buying to wear, for investment, as gifts to themselves or simply to take advantage of a bonus before daily expenses or, worse yet, inflation erode the purchasing power. All be it, these tend to be women who have careers and independent financial resources. For many, the opportunity to own something of great beauty, like an authentic Native American jewelry bracelet, pendant or necklace, with no commitments attached, is spirit-lifting in addition to adding noteworthy adornment to their appearance. For women who have become intrigued by the cultural authenticity and traditional beauty of Native American jewelry, the opportunities to buy for themselves has never been better. Online jewelry galleries such as Native-American-Jewelry.org offer stunning arrays of genuine Zuni, Navajo and other native-designed and native-created pins, pendants, bracelets and necklaces, even rings and earrings. The operators of these galleries range from large and impersonal to small and intimate. Since the latter have minor overhead to cover, their prices can be less expensive than pieces sold in high-cost physical stores or headquarters. As long as they guarantee authenticity and will return your purchase price if you are dissatisfied when the purchase arrives in person, online purveyors are excellent sources of these beautiful works of jewelry art. To make sure you get the real thing, ask the online seller to verify that the object is authentic hand-made Native American work. Ask that your order be accompanied by a descriptive Certificate of Authenticity and confirm that you have the right to return it if, for any reason, it doesn't meet your expectations when it is delivered. You'll find superb silver and gold work, splendid turquoise cabochons, brilliant coral pieces and a wide variety of other gemstones. Why wait for a man? They are notoriously slow to act anyway.